I bought a small brown open back Laiva bookcase from Ikea when I first moved here. Unfortunately, that didn’t do the job so well. It’s now repurposed into a shoe rack of sorts (more on that later) in the bedroom. My dream was always to have a bright white bookcase with color coded books. I understand some people are against color coding them, but it’s just my aesthetic preference. Plus, I know every book I have and what it looks like so it’s not hard to find anything when I’m looking. I have been gathering ideas of what I eventually wanted it to look like. Don’t believe me? Check out our Pinterest Board HERE. After Harvey and I were fully moved in, we took a trip to our local Ikea and I finally got my bright gloss white 4×4 Ikea Expedit. (UPDATE: they discontinued this line and replaced it with Kallax in April 2014) Needless to say, I was overjoyed. We also purchased a 6×6 dark brown Expedit for the bedroom in lieu of a closet (more on that later). As the quintessential nerd I am, I was super excited to get these pieces, I begged Harvey to put them both together that same day. We were able to put both together in a little under 2 hours. It was too late that night to do anything else but the next morning it was on. Picture this….I first stacked the books according to color and then arranged them by size on the shelf. It was so important to me to get it right that I vehemently refused Harvey’s offers of help. “No! Thanks but I know where I want each book to go”, I said. He was probably a little relieved anyway. Ha! When I was finished I was super proud of myself. I just stood there looking at it and smiling for about 10 minutes. Don’t judge me! 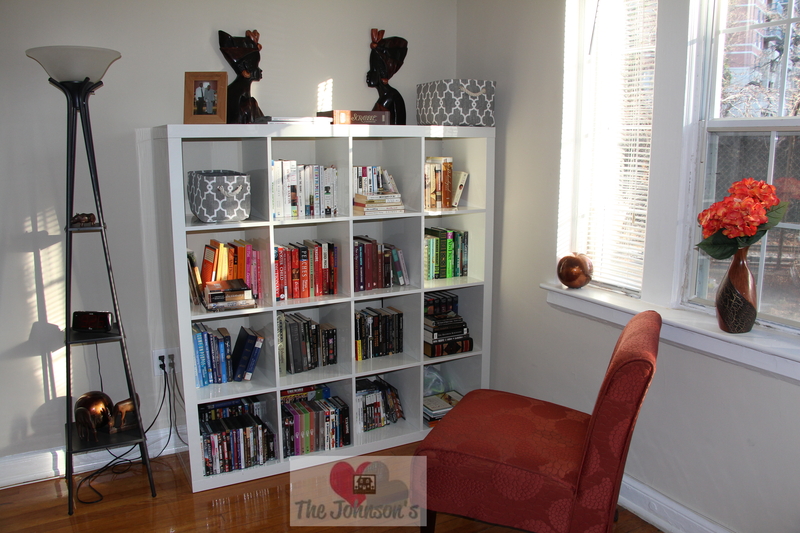 I added my super comfy rust orange accent chair and the rest has been reading nook wonderland history!